An openGear 8-Channel analog audio embedder/disembedder, OG-3G-AMA supports 3G-SDI input and output up to 1080p 60, and automatically detects and configures to the input video standard. It uses 3-pin terminal block connectors that can be set to perform audio input or output functionality. Analog audio levels and audio embedding/disembedding are selectable, with embedding/disembedding on a channel pair basis to pass 3G-SDI input audio or embed input analog audio from 3-pin terminal block connectors. Designed for use in high density openGear 2RU frames including AJA’s OG-X-FR frame, new DashBoard Software support on Windows®, macOS® and Linux® offers remote control and monitoring of the openGear architecture and provides convenient and industry-standard configuration, monitoring and control options over a PC or local network. The modular rear panel allows custom I/O connections per card (included with individual cards). The optional redundant power supply provides a secondary power source in the event of a primary power failure. AJA’s technical support is recognized as among the best in the industry and is available to all AJA customers. If you need assistance with any aspect of your openGear installation, configuration, operation or encounter any technical issue, AJA Support will work with you to get up and running. OpenGear products are covered by a generous five year international warranty. 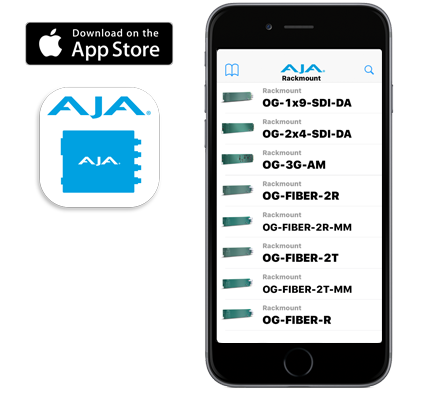 Information on the complete line of AJA Rackframes and cards are now available in the Mini-Matrix mobile app on iOS. AJA product are extensive and this app helps you find the right converter for any situation, wherever you are. Individual products have links back to the main AJA website for more details and you can email product information directly from the app. The free AJA Mini-Matrix app for iPad® and iPhone® is available now in the Apple iTunes® Store. aja About AJA Video Systems, Inc. Since 1993, AJA Video has been a leading manufacturer of video interface technologies, converters, digital video recording solutions and professional cameras, bringing high-quality, cost-effective products to the professional, broadcast and post-production markets. AJA products are designed and manufactured at our facilities in Grass Valley, California, and sold through an extensive sales channel of resellers and systems integrators around the world. For further information, please see our website at www.aja.com.